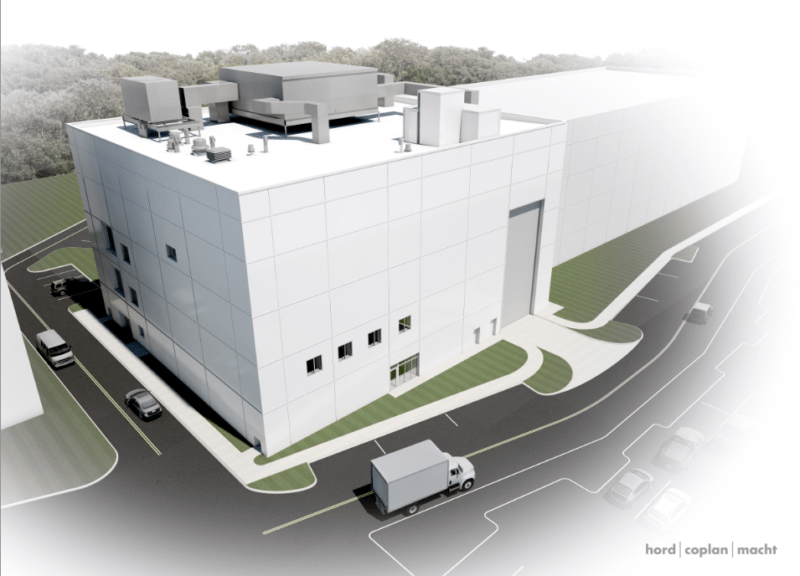 Digital rendering of Northrop Grumman’s upcoming M-SAT facility. Photo: Northrop Grumman. [Via Satellite 07-15-2014] On July 14, 2014 Northrop Grumman broke ground at the site for its new Maryland Space Assembly and Test (M-SAT) building. Northrop Grumman has invested $20 million on the construction of the new facility, which will feature 25,000 square feet of space for satellite projects that will serve mostly government customers. Northrop Grumman is investing in the government space business at a time when other large contractors have emphasized looking internationally. The move signals the company’s confidence in the long-term potential of this market. “Our work in providing space payloads to U.S. government customers has grown, and as a result we need to extend and expand our space systems assembly, integration and test systems capabilities,” said Gloria Flach, corporate VP and president of Northrop Grumman Electronic Systems. Maryland Congressmen Sen. Ben Cardin, D-MD, Reps. C. A. Dutch Ruppersberger, D-MD, and John Sarbanes, D-MD, each attended the event in person and praised Northrop Grumman’s decision to open the facility despite the current fiscal tension in Washington. Sen. Barbara Mikulski, D-MD, Chairwoman of the Senate Appropriations Committee, was supposed to attend as well, but was unable to make it. “[I] want to commend the company for navigating at a very difficult time fiscally in our country’s history, navigating this balance between the commercial clientele and customers you develop, and the government clientele,” said Cardin. “I can tell you, we’ve talked about it: the budget that will come out of Congress will show a priority to these types of programs,” added Sarbanes. Northrop Grumman is currently involved in the Defense Meteorological Satellite Program (DMSP), the Defense Support Program (DSP), the Space-Based Infrared System (SBIR) and the James Webb Space Telescope. Scott Lee VP of space systems at Northrop Grumman said the new facility will support many of these programs, as well as others that he could not discuss. “We can’t talk a lot about the specifics, but what I can tell you is the business that we do here tends to range all the way from producing small electronics assemblies that go on satellites to the full payloads that go on satellites and in some cases actually integrating the satellites here, so it’s a wide range of things,” he said. Located next to the Baltimore Washington International Thurgood Marshall Airport, the M-SAT facility is scheduled to open in May 2015. Once complete, the building will host Northrop Grumman’s largest clean room, as well as a three story high bay area to house operations for space programs. Northrop Grumman plans to use the new facility to centralize previously separate parts of the company’s space business in order to drive down costs while still meeting government needs.